Melissa Shirley Designs Hand-painted Needlepoint Canvas. Fabulous Fancy Santa stand-up is created with the front and back of the design on one canvas! Dressed in an elegant long burgundy coat, he is holding toys and a tree, with a tasseled bag on his back. Canvas size is approximately 21 x 16 1/2 inches. Design size is approximately 6 x 10 1/2 inches for each side. It has lived in a smoke-free environment. 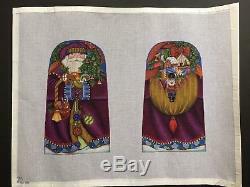 The item "Melissa Shirley Designs Hand-painted Needlepoint Canvas 2-Sided Fancy Santa" is in sale since Friday, December 7, 2018. This item is in the category "Crafts\Needlecrafts & Yarn\Embroidery & Cross Stitch\Hand Embroidery Cloth & Canvas\Plastic Canvas".